Published by Cyril Huze September 10th, 2015	in Builders, Editorial and Events. 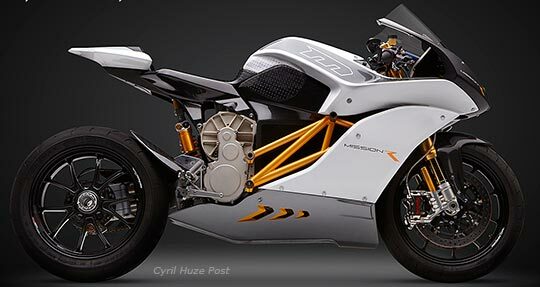 Mark Seeger, CEO of San Francisco-based electric motorcycle company Mission Motorcycles, Inc. filed for Chapter 7 bankruptcy saying in a letter to the court that his company has no more money and can’t afford an attorney…The company was created in 2013 with 2 partners and at the time announced the production of 2 electric race models, the Mission R and Mission RS. Each were supposed to be an extremely limited production of 40 units. Both models were announced at under 3-second 0-to-60 mph acceleration, 150 mph top speeds, and a range of up to 140 miles. In November 2013, Seeger’s partner Vincent Ip left the company and Mission Motorcycles filed a suit in December claiming Ip signed a stock restriction agreement that allowed the company to buy his shares if he left the company. IP filed a counter suit alleging that Seeger refused to disclose Mission’s finances. The lawsuits were still pending. No Mission motorcycles have been produced in 2014 and it is unknown how many have ever been manufactured. Website and Facebook page have been removed. Considering the high boondoggle results of other various “electric products” all I’m wondering is if there were the usual public funding perks like tax deals, co-investments, etc? They probably would have survived if they were based in a lower cost of living area. Also selling a motorcycle targeted to a specific group of riders that cost as much as an electric car doesn’t help you get sales. Where are you Eric Buell? With a few frame mods this bike would look pretty good if you could stuff your new motors in there. Tom, I think EriK Buell has a hell of a frame already. Handling has never been a Buell negative. Man two wheels and a motor is a motorcycle. 0 to 60 in less than 3 ticks. That there is riding. All things being equal I like gas explosion bikes better myself but plug in bikes are here to stay and anything that brings game to this way of life is fine with me. Harley is in, Victory is in. Someday our kids or grandkids will be tricking out electric rides. The other side of the coin is any time a motorcycle startup fails it’s not good news to me whether I would ever have owned that product or not. Not a good business strategy. Electric vehicles have been made for well over a hundred years now, still haven’t caught on… not just here in the U.S., but the entire world. Nobody wants them, they are a novelty at best. Wonder if they approached Elon Musk to takeover and assume debts and expenses ; if I was in their place I would have. Once battery technology catches up and these critters can do at least 200 miles at a pop and the selling price gets closer to $14,000 they will start to sell. I don’t believe Mission received any public funds, so I’m not sure Obama had a stake in this one. I could be wrong though, would be interesting to know if they actually did. I’m a spark and gas guy myself, but frankly, as long as a twist of the throttle can stretch my arms and whiten the knuckles, I’m pleased as punch to ride just about anything with two wheels. The way i look at is if all one wants out of a motorcycle is basic transportation, then -yes- given a marketable price point e-bikes would be a viable product. For those who eat, sleep, dream, live & love motorcycles…. it never was about getting from A to B. Its was always about the journey. It was about self reliance and developing the capabilities to take on the road and everything it threw at ya. For competitors it would be the challenge of conquering the technology in the framework of the rules. So if you take internal combustion, out of the equation and introduce e-technology like traction control and stability managers, then what’s left….. choosing shocks & a tire….??? Everyone gets a hole-in-one…. we’re all equal…. i’m OK, your OK…. A golf hero all of us. Stopped watching Indy when they tried to be like formula-one. But ill watch the USAC Silver Crown front engined roadsters all day long. Maybe, just for laughs, people should start companies with the number 1 goal of MAKING A PROFIT. That way, secondary goals like “racing” can be afforded. Profits help clarify a market… At least if you’re not a socialist. Then profits are BAD. Does anyone have any idea who is handling the Closing? I’d like to buy the company in bulk.